Indifference is why I go to the back country. Time without human measure. My grievances with health, equipment, and judgment bear no consequence to the terrain I enter, only to the fickle rational of my influenced intellect. 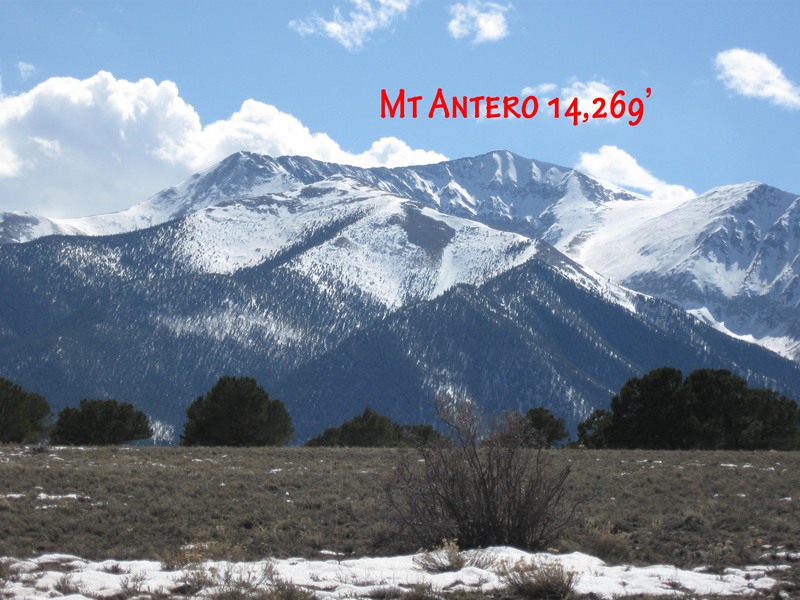 Mt Antero has a 4×4 road almost to the top. Zach and Fritz sorted out the final route to the top while James packed up for our retreat down Brown Canyon. Both routes looked straight forward and we would meet at a car we stashed near Princeton Hot Springs later in the day. I lamely offered to ski out alone, knowing their better judgment would never condone splitting the party with my health situation undefined. I felt badly that James was saddled with baby-sitting me out, actually it was honestly embarrassing because I knew it was his strength of character, or better judgment that would never allow him to shirk his responsibility… the same judgment I questioned two nights before was getting me out of the mountains now. As the snow line approached and houses appeared I checked my phone for service. On a windy rock outcrop I called my skiing buddy/ doc to get the scoop on my health options. Surprisingly he said if I used enough drugs it was feasible to continue – if I hydrated properly. Last year at this time James and I skied across Yellowstone Park together. It was a trip that I’ve told friends was one of the best five trips in my life. I value his friendship and trust him. As we sat in the parking lot waiting for Zach and Fritz, unable to find the connection from a year ago, I realized this was not about right or wrong – that was I brought into the hills. This was simply the inability of us to find solutions together, the whole of our team was much less than the sum of its parts. James had it right when he said, ‘We knew EVERYTHING would have to go right for this to work – it’s a big trip’. Despite my recent health advise I was spooked. Not the clearly quantified insight in movies, but the instinctual realization that if I could not contribute to the success of this trip I no longer belonged on it – regardless of the rational. Godspeed James, Zach and Fritz. It wasn’t a gentle nudge waking me up just after midnight. More of an instantaneous understanding that if I wasn’t outside of my tent in the shortest time possible there would be some smelly consequences… Since my early teens I’ve carried an intestinal hitch-hiker, a viral reminder of my human frailty. In the fraction of a second it took to move from dreams to action I remembered the heartbreaking, intermittent times this weakness had changed my hopes and dreams – the last time being camp one on Cho Oyu, Tibet in 2004. This was serious and I had just become the undeniable weak link. Between my interval training to get out of the tent and worrying about how to salvage my conditions I got no sleep for the rest of the night. I doubt James had much either. We got up after dawn and as the sun lit the valley’s below I sparsely told James that I was dehydrated and weak from significant loss of blood. I suggested they shoot up Mt Tabaguache (our second peak – 14,155’) and meet me back at camp. They agreed and were up and back in the time I could catch a short nap. Spirits were improving among the group and I was holding out for a miracle at lower elevations. Maybe with a short rest I could get my feet under me and continue. Water was still going through me flash flood-style and hydration was challenging but there was really only one way out and it seemed plausible even a bit under my best. 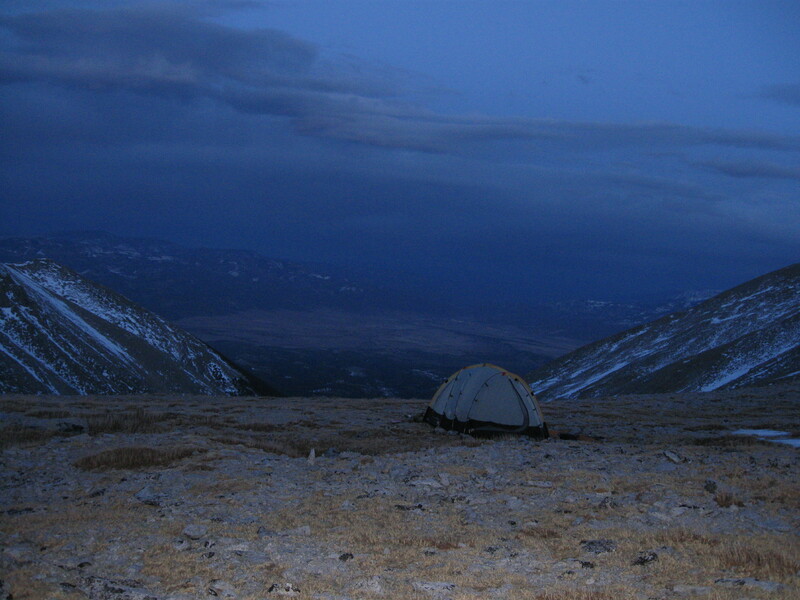 From our 13K’ camp we traversed into the previous night’s drainage of contention and put on our skis. James was ready first and said he would ski to the top of the knoll, above the wind-loaded section – just above the segment that we could not see. Instead of following the most rudimentary, basic protocol of avalanche safety – marking him visually as he descended – I followed him down. I had just tossed my avalanche safety merit badge down the drain. The skiing was similar in consistency to the ice and ‘packed powder’ of my early days in Michigan with only occasional marks left from our turns. As we turned left into the unseen dog-leg the snow became considerably more chopped wind pack but harmless and very ski-able. My concerns about unknown terrain danger the night before proved unfounded and I sensed my credibility was plummeting. Again the sun was brilliant and temperature at noon was in the 60s. 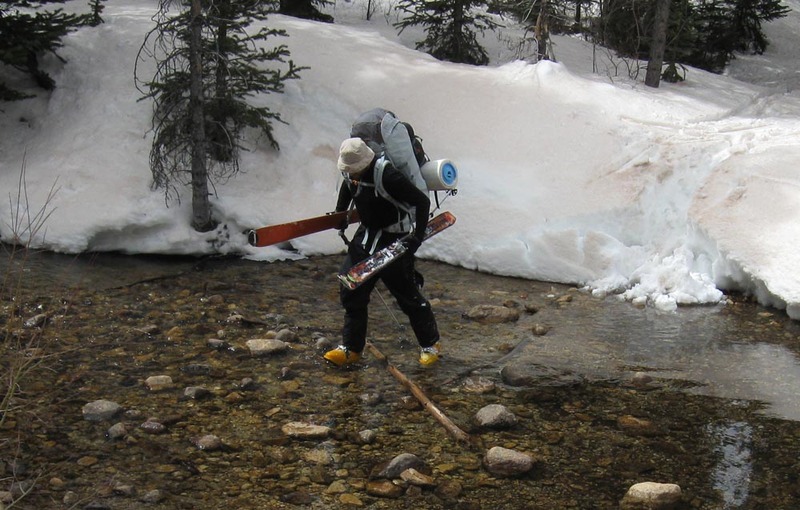 As we skied out of the drainage my body started to register the cost of my night’s adventures. I was light-headed, cranky and was having trouble keeping up with Fritz and James. It was also painfully clear I was in no condition to keep up with this crew in this situation. We took the afternoon off for my benefit and I tried to sleep myself back to health in our 11k’ camp. My guts were still in revolt but with less enthusiasm. 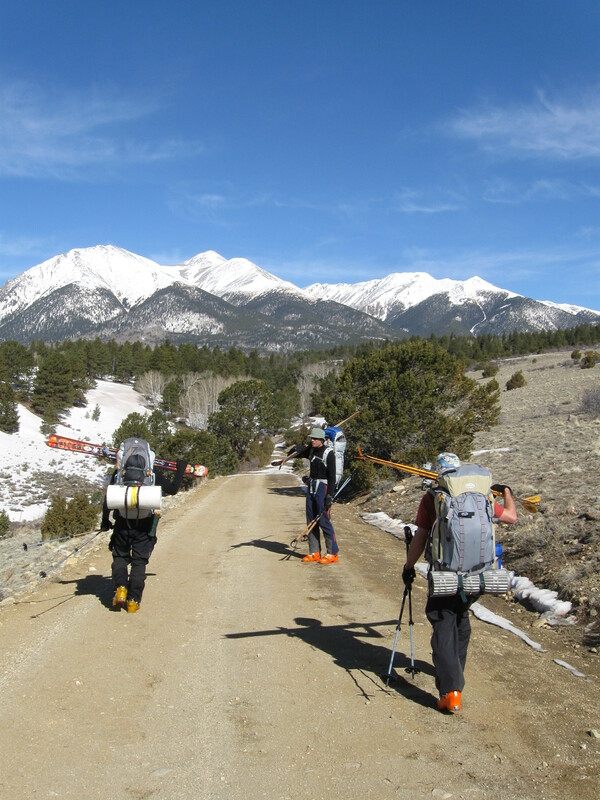 Through a series of stilted conversations we devised a plan for tomorrow that would get Zach and Fritz up the next peak, Antero 14, 269’, while James and I skied out Brown Creek Trail. We would rendezvous at the bottom. I fell asleep early. Fritz expertly navigated his loaded teal green 4×4 van up the slippery snow and mud covered road below our first peak. At 9:00 AM we started skiing through snowy sagebrush, across the anti-climatic high plains toward the Mt Shavano/ Tabeguache trailhead. It was already 65 degrees and the plan we agreed to yesterday, for a lighter day of skiing to ease into the trip was underway – Springtime in the Rockies style. 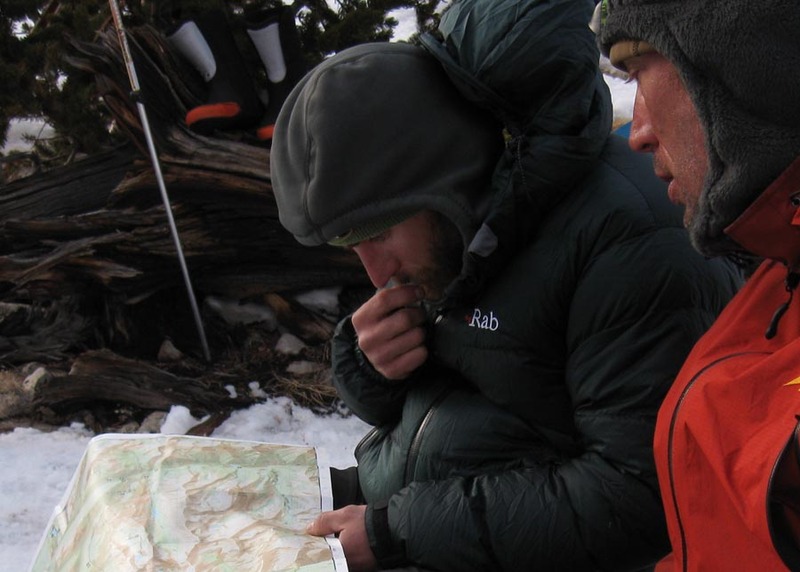 Acclimatization is the fickle game of predicting the rate your body will adapt to functioning at higher altitudes. It effects everyone differently and often inconsistently. In the late 90’s while developing outer wear for The North Face, I was surrounded by some of the mountaineering legends of their sponsored athlete program – like being able to talk driving strategy with Michael Schumacher. 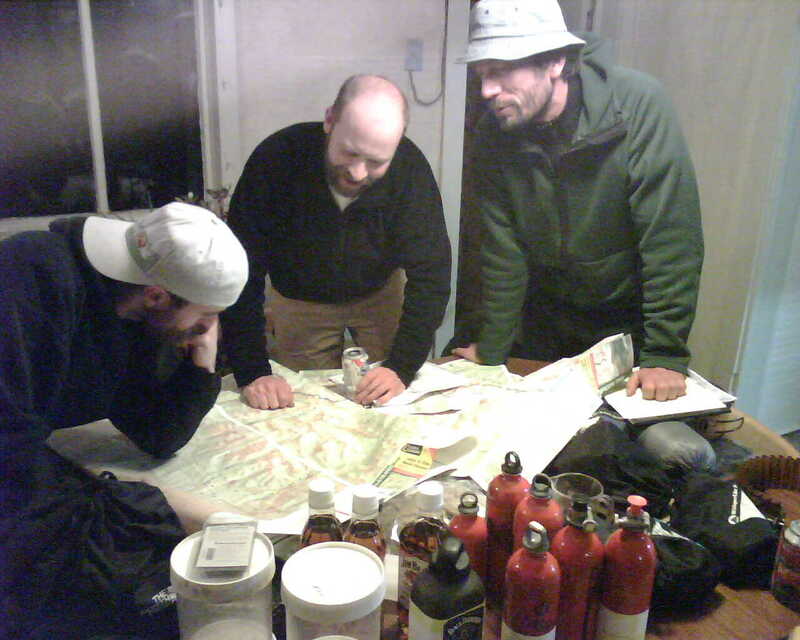 I had been scheming ways to get to 8000m peaks and was hungry for their advise. 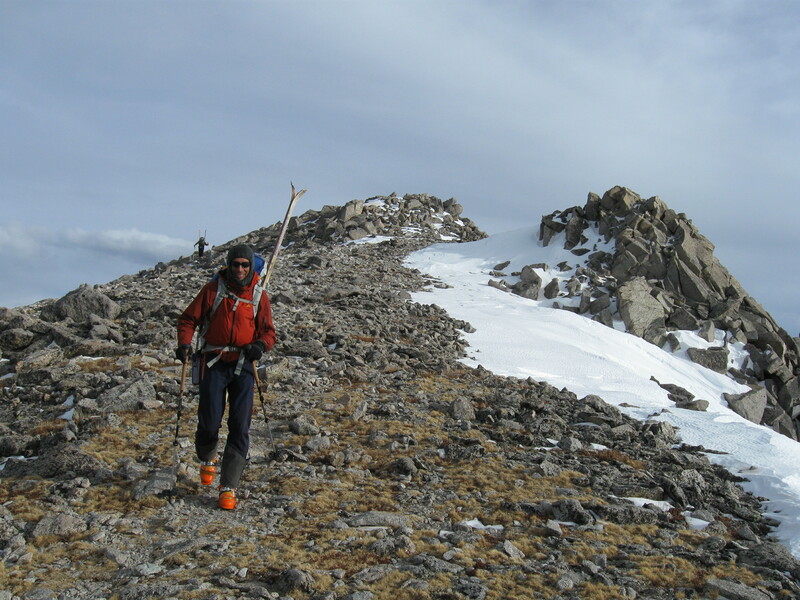 Each said in their own version that fitness and the ability to adapt to altitude are often at odds in the mountains. ‘Fit guys are able to go too high too fast, then get into trouble because they have not acclimatized properly’. I heard what they said but it has taken more than ten years to understand the indifferent nature of the beast. 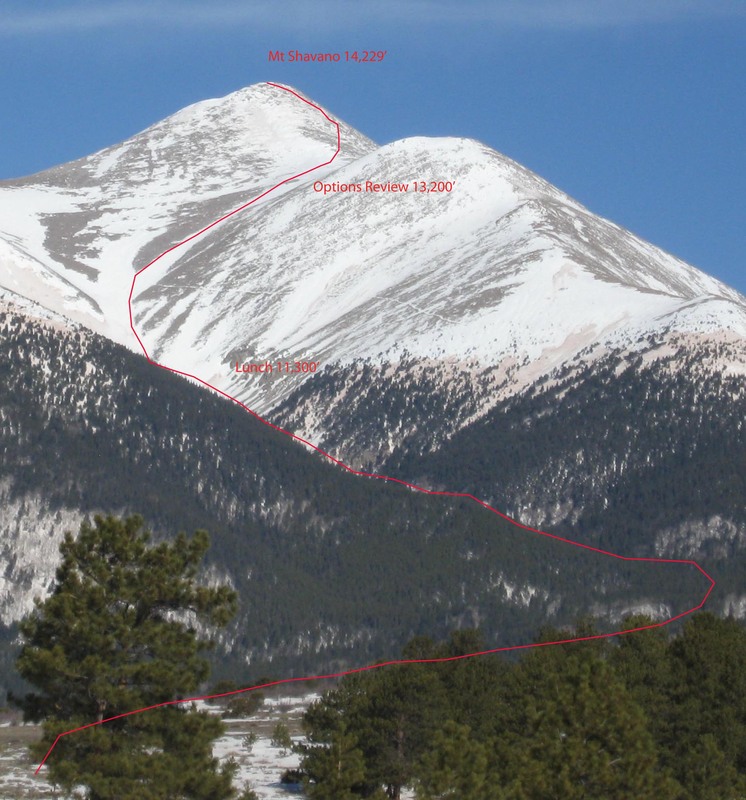 James outlined our route – according to our National Geographic Maps topo, we were starting at about 9,000′, we would ski over Mt Shavano at 14,229, descent to 13,600, over Tabeguache at 14,155′ then ski down to 11,000 via an unknown ridge off the northwest summit of our second peak, Tabeguache. 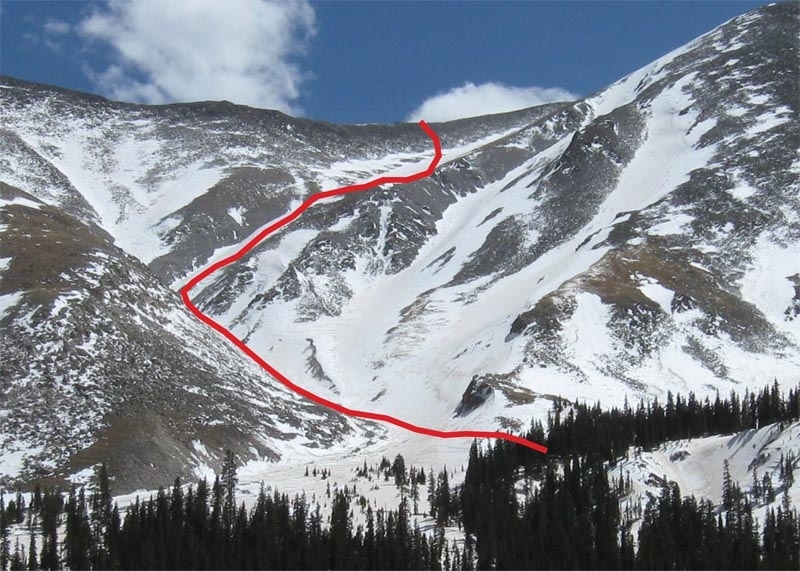 It was the best we could see from our map and would also position us to summit peak 3, Antero – 14,269′, tomorrow. 6.000′ up – 3,500′ down – 8 miles. Eventually we broke out of tree line by mid-afternoon, in six hours we were about a third of our vertical goal through the easiest terrain. We took a break in the sun to reward ourselves and eat some lunch. Our 50 lbs packs were slowing us down a bit but the temperature was still above 55 degrees and sun was everywhere.. We opted off the summer trail in favor of the most direct route up the center of the snow loaded drainage. 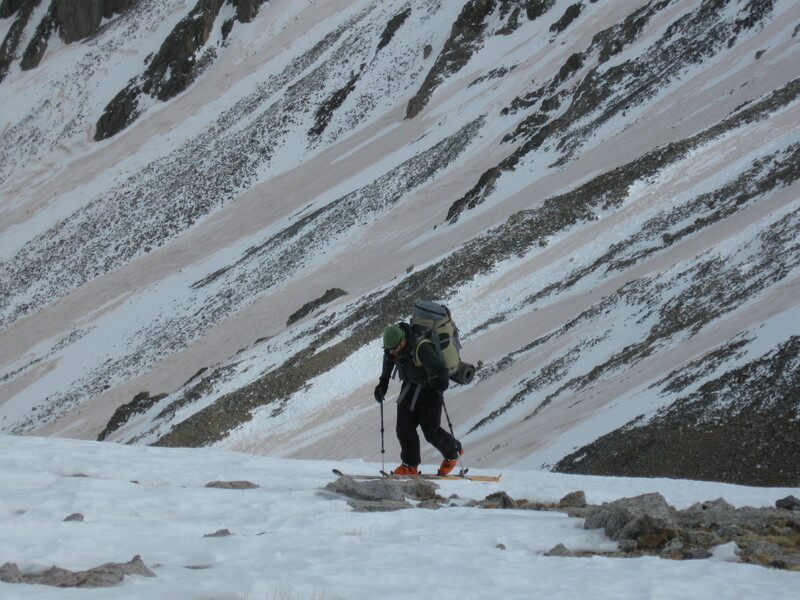 A perfect combination of hard, wind packed snow and brand new Black Diamond STS Climbing skins on the bottom of our skis afforded us the opportunity to climb up the steepest, most strenuous line toward the summit. This crew saw STRONG! Each step required careful placement and a secondary ‘stomp’ to seat the directional hairs of the skins into the snow for traction. Lose purchase and your skis slide you and your load racing backward until you can arrest yourself with a maneuver best describe as a giraffe drinking water on ice. Near the top of the gully leading us to 13.300′ the angle lessened and my mind started to wander. I looked at my watch and turned on my mental calculator for the first time that day. Our pace was slowing in relationship to elevation gained and at this rate we’ll be 9 hours into our day by the time we summit our first 14er. I looked around but could no longer find our casual day. It may have been hiding behind the second peak of our day’s agenda – Mt Tabeguache – but I couldn’t see that yet, either. I caught up to Fritz (because he stopped) and said ‘I think we over-extended ourselves today’. ‘But that’s what we do, we park the car and ski to the summit’. Looking around there were few more options than backing down or camping above 13,000′. We stood taking it in as James and Zach approached. I restated a version of my thoughts to them and searched for our casual starter day again. I was reminded again we agreed to this plan at the car and we really had no other choices. 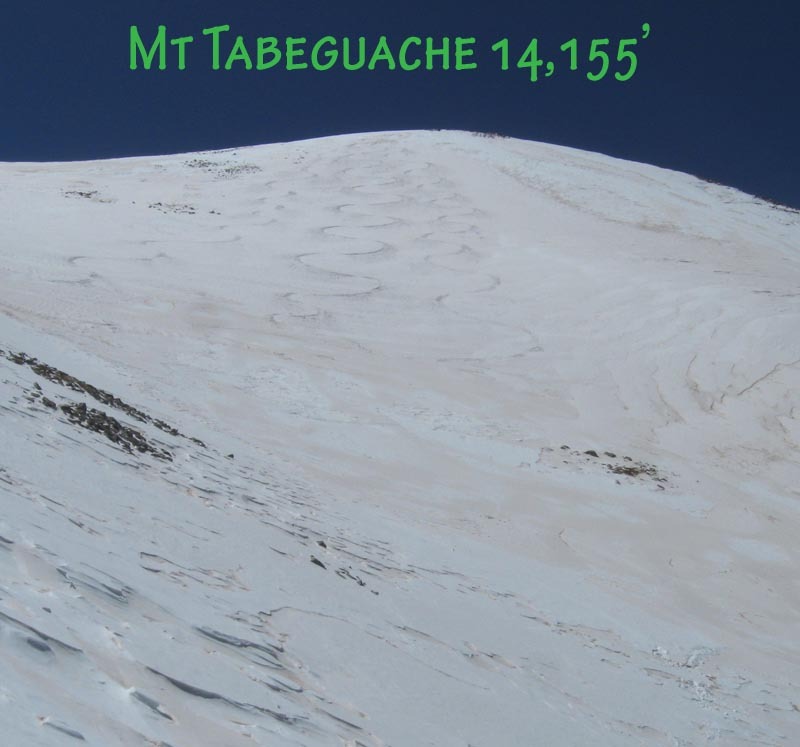 After a bit more non-associative discussion we opted to summit Shavano then go down to the saddle below, which the map indicated might offer a less steep descent than the NW summit of Tabeguache, and re-evaluate. 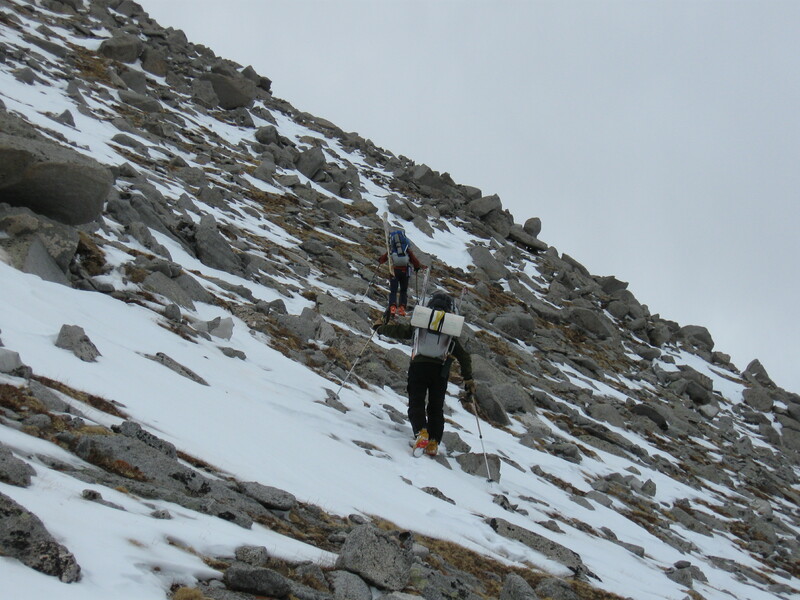 For the last 1,000′ we climbed snow-covered scree about twice as steep as your average stairway with skis on our packs. This is an acquired taste best consumed/taken in small doses. From boulder to boulder each step seemed to be higher than my legs wanted and sapped my strength with the balance required. SCARPA had provided us with the very best boots they could offer – their Maestrale boots. They are super light and supple going uphill and stiff and responsive going downhill. Unfortunately there isn’t a boot out there that can change the stiff sole and restricted ankle movement to make it more friendly in scree – most likely, snow-covered scree and ‘more friendly’ rarely coexist. 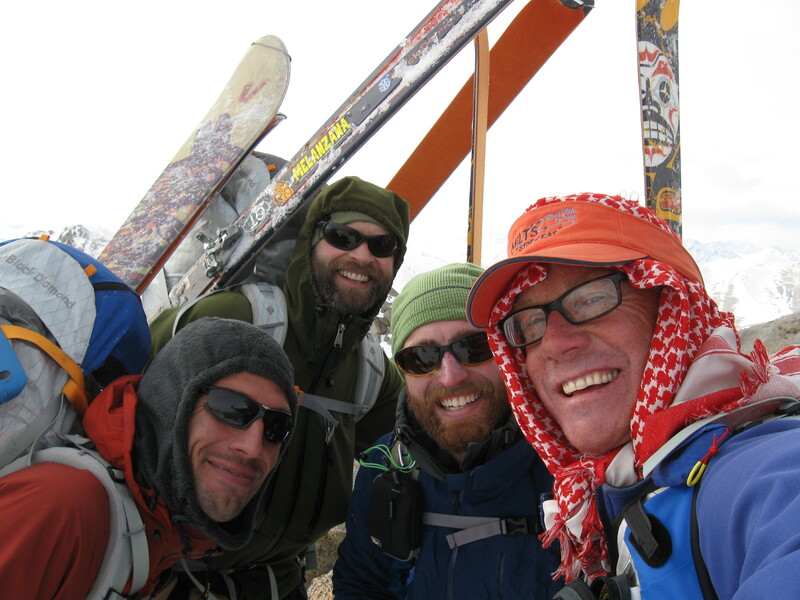 Just before 6:00 PM we gathered on the summit of Mt Shavano – 14,229′ – nine hours into our casual day. 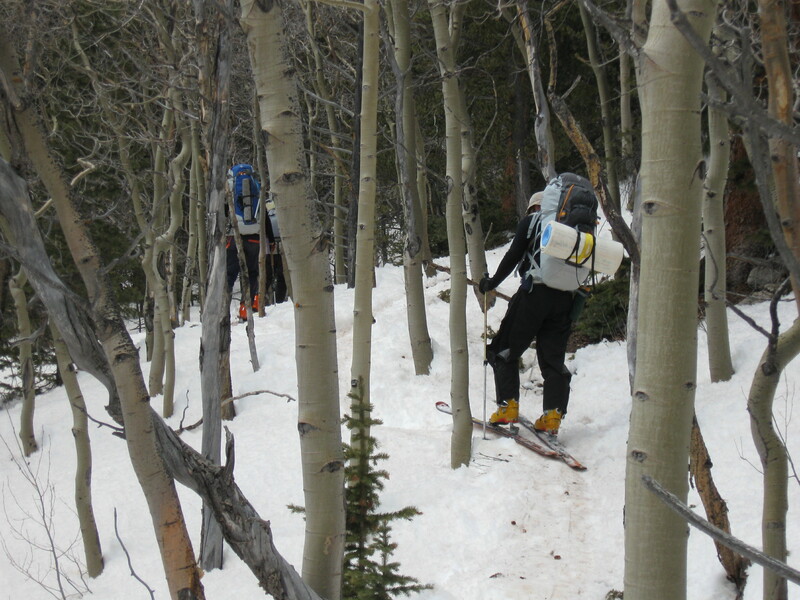 I was dangerously close to having my ski-mountaineering merit badge revoked. Looking across the saddle to Tabeguache, a solid hour push with 1000 ft of descent and climbing just to reach the summit, we didn’t even have to bring that option up. 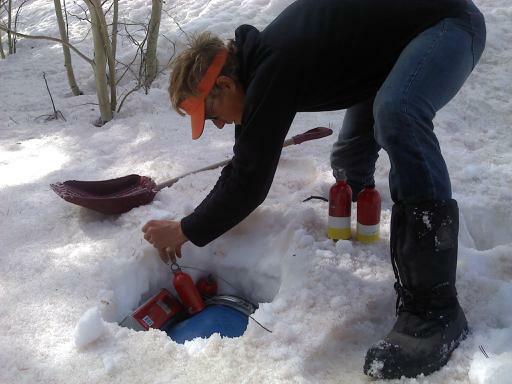 I was worked physically, out of water, and I was demonstrating hints of altitude intolerance. My instincts were cautioning against ‘epic’ and experience reminded me every decision remaining in our day would either contribute or prevent that end. We descended more scree (a different kind of tricky) to the saddle between the two peaks with little light left in our day. We looked down the 2,500′ snow slope that we hoped would lead to a camp at the lowest altitude en route – 11’000. However we could not see the middle section of the descent due to the steepness of the slope. I skied down a few hundred feet to get a better view. The snow was so hard my skis were not leaving tracks, presenting the possibility of a violent collision with rocks below if we accidently fell. Looking down the snow-loaded slope I could see that just over halfway down the slope narrowed into a gully maybe 30′ wide, dipped under a 200′ long cornice/ drift, then dog legged left and out of sight for hundreds of feet. Scanning the area about half the drainages I could see ended in cliff bands and the others looked ski-able. From our viewpoint there was no way to know what was in the gully that was out of sight. Quite possibly it would go – but if it cliffed out, became significantly more of an avalanche risk or it slid we would have to deal with a rescue or a difficult exit in the dark, compromised from our strenuous day. Fritz, Zach and James seemed sure the one square inch of uniform topo lines on our map, defining the section of gully we could not see, indicated a predictably safe descent . I had met some of the cartographers at the National Geographic Maps headquarters in Evergreen just before the trip and knew if the lines did not pan out to be as we hoped I could take it up with them, and their manager after the trip – if I was alive. I’m also weirdly afraid of the dark and am not completely sure yetis don’t lurk in the shadows. Consequently it wasn’t that unpredictable that I was not keen to ski blindly into a promising map interpretation – after our 10 hour day – at dusk – on our lighter day… . It would be safer in the morning with fresh legs and plenty of daylight if things got sideways. Ultimately I refused to ski into the ‘chute of the unknown’ at dusk and we camped at 13,500′ – our group dynamics now completely polarized. I felt that the ‘too scared to ski the slope’ label that I was now being tagged with was not entirely fair. It wasn’t fear of the slope I could see but concern for entering a situation whose consequences were hopeful but absolutely unknown. Acceptable risk – ideally founded on experience and proved over time. Mine ran more conservative than theirs and because theirs were based equally on their perceptions it was difficult to synthesize. The inability to reconcile these types of differences could play on the outcome of our journey. Dinner was a lonely affair of pasta, salami, cheese and more pasta – each item sulking in its own corner of the plate, separated by far more than just a pathetic excuse for an entrée divider. By standing up to the rest of my team for what I strongly believed was the only safe decision I had violated a bond among my Leadville compatriots and was overtly cast to the outside of the Xtreme Guy Club. I tried in vain to remember the secret handshake but all I could come up with was the Boulder Brodeo. Likewise, I wondered if I’d brought my membership card but realized I’d left it in the pocket of my BASE rig. Or was it still in my free-diving speedo? Or in that little pocket on the Red Bull helmet with my rocket cycle at the salt flats? Strangely enough a fox approached our camp. At first it startled me but it was also somehow reassuring as it trotted through the edge of our headlamp beams. I climbed in my sleeping bag early and alone with the lights of Salida glittering a world away, unaware of what I would face in the upcoming hours. April 10 – Annnnnnd, They’re Off! 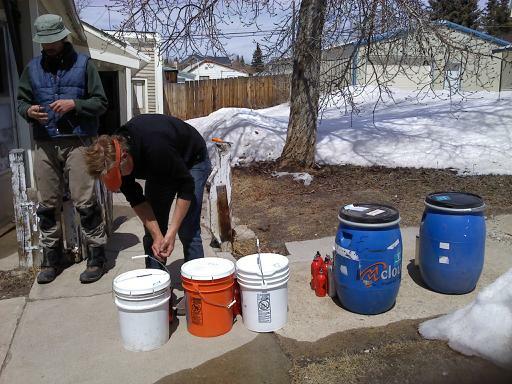 Packing caches at Fritz's. Fuel? Check. Vaccuum-packed, fresh-roasted, Ethiopian Yirgacheffe coffee? Check. Everything else is ultimately superfluous. 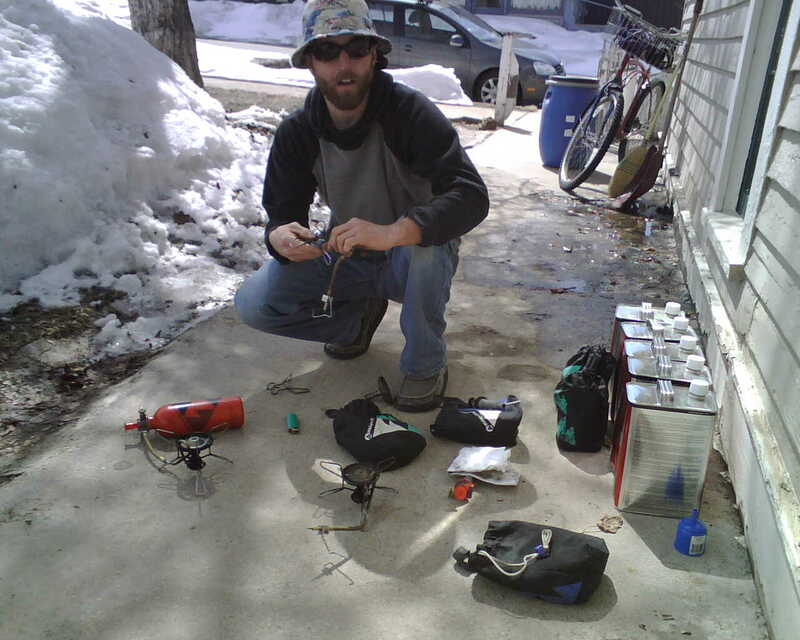 After sorting and resorting the gear the crew packed up the caches and drove halfway around Colorado strategically placing them. Burying the biggest cache of the trip, the Cottonwood cache. 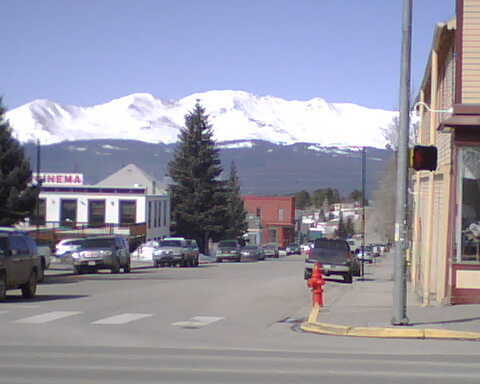 The team's 14th and final fourteener, Mt Massive (14,421ft) seen from downtown Leadville. At the trailhead with Mt Shavano (14,229ft) in the background. Finalizing plans over tacos, enchiladas and margs at The Grill. Greetings from cyberspace. 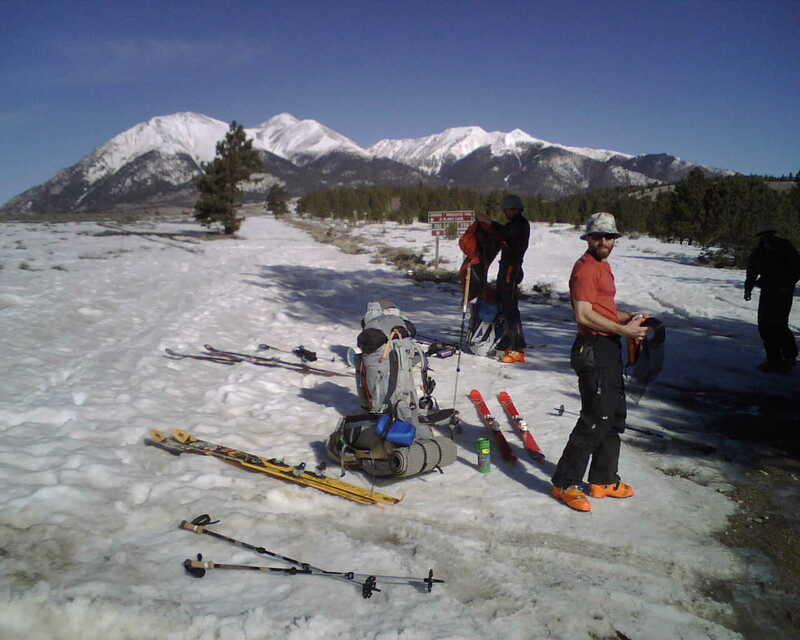 Guest blogger Trey Cook here, organizing (or not) cyber-transmissions from the Fourteen 14ers crew while they’re out gallavanting in the snow. Anyway, no more slacking. I’m on it. (Until the next dump anyway). So the crew all convened in Leadville on the afternoon of the 9th and began the first step to every expedition … getting sorted. Stage One: get mentally sorted, which of course means a few rounds of everyone’s preferred spirits. 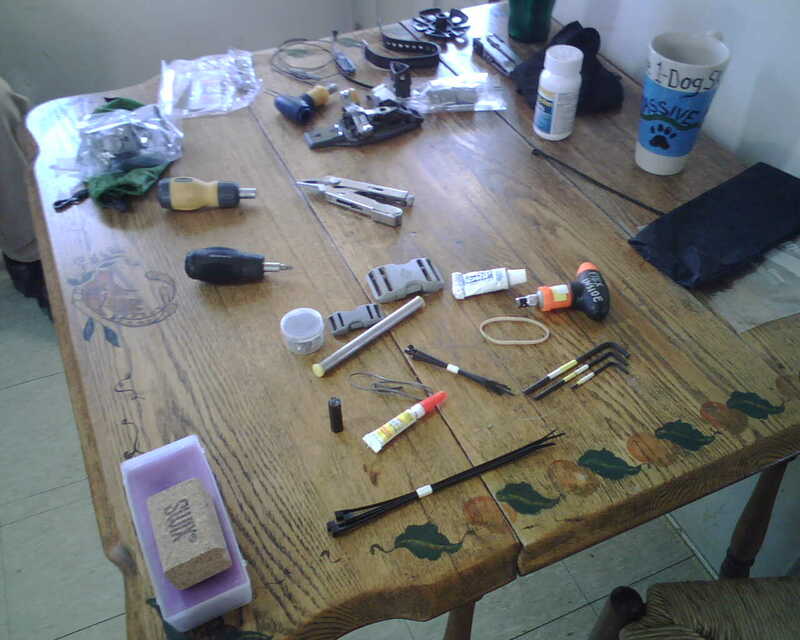 Stage Two: now that everyone is thinking a bit more creatively, it’s time to play with … ahem … I mean, sort gear. Seventeenth and final stove check. Two hours speculating route and planning caches. 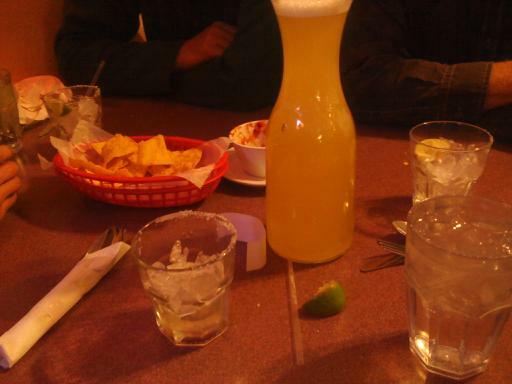 The route got more intesting as the tequila bottle got more empty. 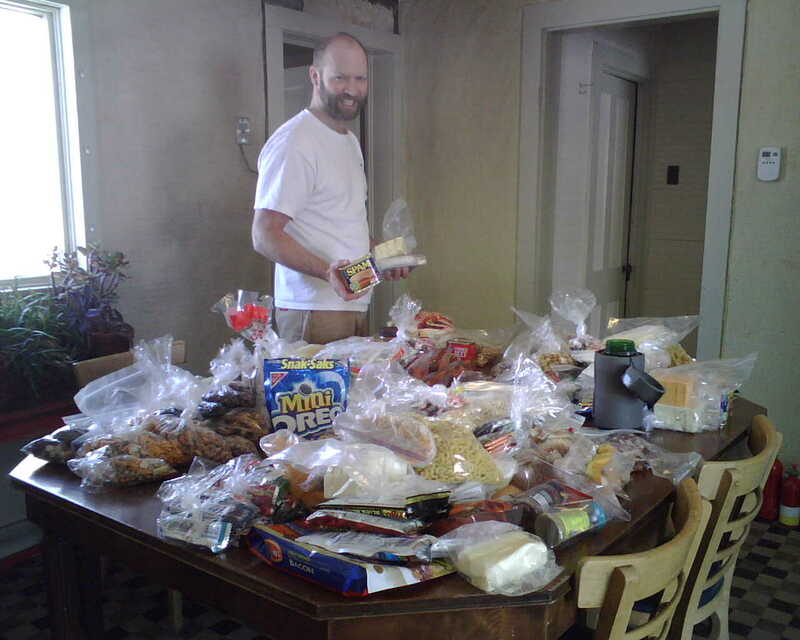 Backcountry Master Chef, James Healy. Believe it when I tell you there is finely-calculated method to this madness. These are the entire contents of Zach's pack. Oops, sorrry. Read that wrong. This is the gear that didn't make the final cull. (Bold move leaving that rubberband behind but that's the kind of gutsy call this team will have to make to be successful).